It's 40 degrees out and my down coat is still in heavy rotation, but I've got spring on my mind! After my whole debacle of trying to figure out the mysterious hidden button placket, I didn't even use it! I agreed with Colette's suggestion that a smoother placket would look better. With Ann's Threads article on grainline in mind, I took advatage of the linear pattern of the swiss dots and cut the pattern pieces on the bias. Topstitching the seams really helped to define the various grainlines. Omitted the neck bow-tie, obviously. I love the 3-piece bib front - it provides shaping that you just don't get on a single-piece front with bust dart. this looks fantastic, wow, perfect! Fantastic blouse, great fit too. So cute! I love the swiss dot. This fabric stops the shirt from being too cuetsy! I love this top. I looked at it in the magazine and I was debating on making it. I don't know why it didn't click with me that this is just a shoulder princess seam because I was concerned about how to do an FBA. I just had a "DUH" moment. Yours looks fabulous and I love the fabric! Very cute blouse, love your fabric. 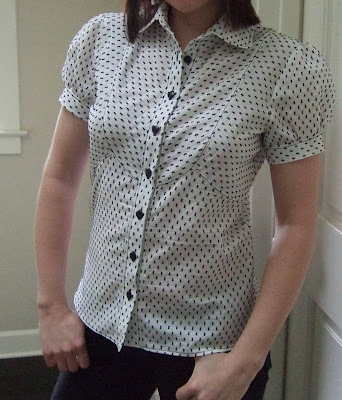 I just finished the long sleeve version of this blouse (need buttons) and left off the hidden placket, I couldn't figure it out either. Christina I love what you've done with the fabric grain orientation!! Really takes it up a notch. I finally broke down and bought this issue at Stonemountain this weekend, but I skipped right over this blouse because of the bow. Great job! It looks great! I love all the details you put into the top: the topstitching and playing with grains. It looks like a lot of effort but well worth it. This is a great blouse and it definitely looks great on you. I love the seaming and topstitching details, they are just perfect. Congratulations! Just love it!You made a beautiful blouse. What a lovely blouse! The fit, the style, black topstitching, your fabric choice and how you used it. All perfect! I hope you get to wear it soon. It looks fabulous! I hope I have time to fit that in with the rest of my Brazil SWAP pieces! So special with this fabric. Indeed time for spring, so sunny looking this blouse is. And I fully agree on your last line. You have done a lovely job with this. Very pretty! Ooooh perfection! I love this blouse, it looks absolutely great on you and the fabric is gorgeous! That shirt is fabulous! You really made that fabric work for you, too. I didn't even remember it as being directional, but it's so subtle and it just WORKS. What a really cute blouse. Love the fabric and I love the way you used it to it's best advantage. Looks wonderful. And I have to agree that there's a shape to this that is very feminine. The fabric is darling, too. Funny, I am planning this blouse next, too! Great top, I really love the fabric you used. wow! i'm totally impressed. i followed the link to the pattern (i think). where did you buy the pattern? The blouse is gorgeous! Topstitching and bias are perfect! Very well done, Christina. Too cute. Outstanding job, Christina! Just perfect! Great top. 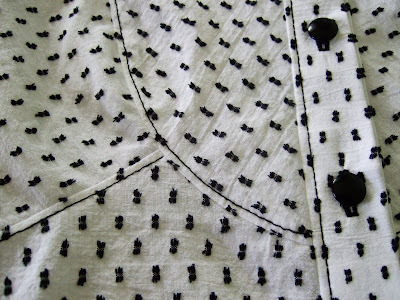 Love the topstitching details and the use of black thread. Makes it really pop. Even my teen DD loved it. Wow! To me this as the ultimate blouse, it has everything that I love ; swiss cotton, an intricate and fitted cut and puff sleeves. You have done an amazing job! What a great blouse! I love what you did with the fabric--good call there--& it looks terrific on you. I just found your blog and you are so talented!!! That blouse look great on you. May I ask a stupid question: What does BWOF mean? Rachel - Perfectly valid question! BWOF stands for Burda World of Fashion, it's the magazine where the pattern is from (you can click on the link below the first photo). Great version of the blouse. I love it. Very pretty. 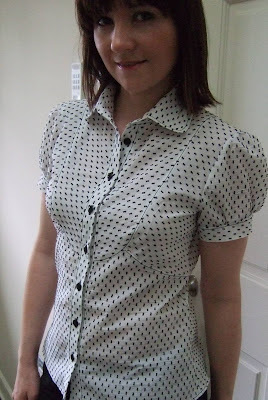 I really like the subtlety of the change of grain line that the dots bring to the blouse. Not in-your-face change, but pretty and subtle. Late to the party, but may I say, "WOW!" That is one fabulous shirt. It looks fantastic on you, and you did a great job with the grain! I have a question about the buttonband on this shirt. The pattern says NOT to have seam allowance on the lengthwise edge of the front band. So that means BOTH sides do not have 5/8" seams? Mine seems to be coming out weirdly shallow on the front and narrow on th wrong side. Hope you can help.